The Ricoh Arena, the home of Coventry City since 2005. 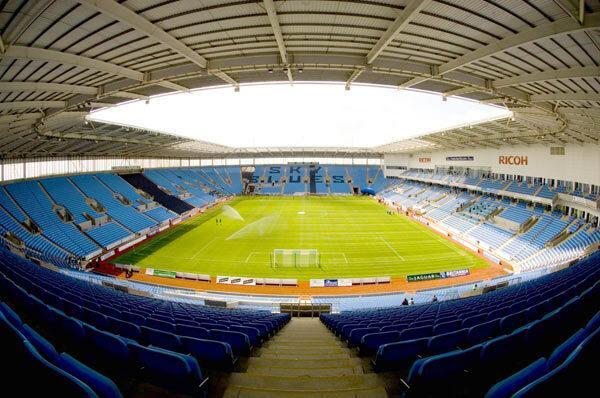 Arena Coventry Limited (ACL) say they were surprised by Coventry City Football Club Chief Executive, Tim Fisher’s claims that the Sky Blues have left the Ricoh Arena, their home since 2005 and intend to build their own stadium. “My personal impression was that this was an announcement made on the hoof. “There’s not been any suggestion of another stadium in and around Coventry in anything Mr. Fisher or the club have been saying over the last few months. “The Football League are looking for a whole host of things. A ground in the vicinity of Coventry is one of those things, but a club with financial stability is far more important. “Mr. Fisher is a director, or the director, of a company that, according to the administrator’s report, is £70m in debt and was described as a ‘catastrophic insolvency’ by the administrator’s own barrister. Many fans have contacted The Football League with emails expressing their concerns over the future of Coventry City Football Club and the way it is being run by owner’s SISU, but the League are yet to respond leaving frustrated supporters even further in the dark, and this latest development is likely to only fuel concerns. « Coventry City to leave Ricoh Arena & build new ground.